Networking at events and getting names and numbers can sometimes be like an eighth grade dance. There is some awkwardness and the fine line of being too passive or overly pushy. You don’t want to blow it with your elevator pitch. Every event goer knows that networking is much more than shaking hands, making small talk, snagging a free schwag bag and getting business cards. 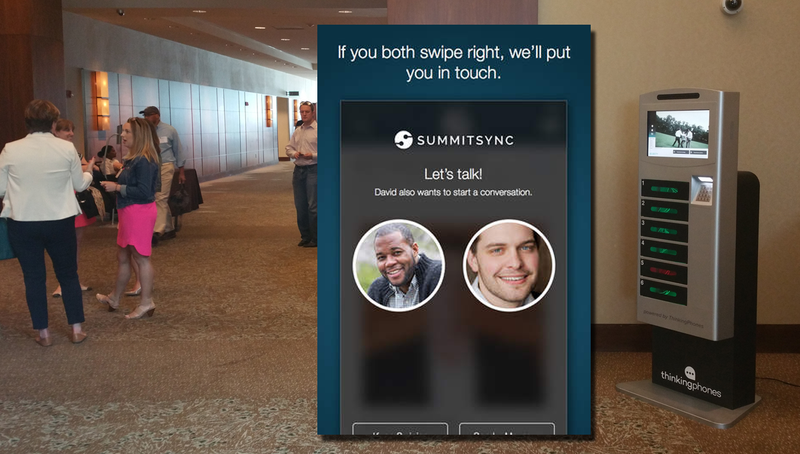 It’s about meeting people, sharing who you are and what you do, and gaining relevant, quality contacts and industry related information that you can use to become a more informed industry expert or a top selling sales rep.
SummitSync is an app takes some of the struggle out of networking onsite. The app combines a fun, easy-to-use social networking and discovery frontend with enterprise-class features for data capture and CRM integration on the backend. A user sign-ups by using their LinkedIn credentials, selects the conference they are attending and swipes right (interested) or left (not interested) when event attendees appear. This upfront filtering system and inherent double-blinded opt-in nature of the app, makes it an easier process to connect with only those interested in meeting as well. When a mutual connection is made, in-app messaging, as well as access to the user’s email, calendaring tools and CRM systems are readily available. SummitSync is a single download for all events that offers post-event reporting, relationship management and the upfront data and analysis needed to do business effectively. In other words, it’s a must have for event goers. When there are apps there are a mobile devices powered batteries that require charging. Event goers fear dreaded dead battery anxiety. They scurry around tradeshow floors looking for an electrical outlet and then stand or lean by a wall waiting for the red light to go green – all while attached to a cord and outlet. This limits the time event goers get to spend talking to companies they are interested to. When events have charging kiosks people are able to securely charge their phones without being tethered to the wall. Veloxity is a company that helps keep customers happy and charged at events and venues and retail locations worldwide. Event goers can stay engaged using apps like SummitSync by powering their devices with a Veloxity device charging solution. Veloxity rents and sells a full suite of device charging solutions to events, conferences, conventions, trade shows, universities, hospitals, and other venues nationwide. Clients like Boston University, Red Bull, Travelers Companies, IndyCar, CES, Foxwoods, Verizon and others rely on Veloxity device charging units to keep customers and guests happy and fully charged. The product line includes LockerPower freestanding and wall mounted kiosks with lockers and Power Pax portable units. Veloxity is based in Boston, Massachusetts and is on a mission to cure dead battery anxiety. SummitSync and Veloxity are on a mission to help facilitate event networking, promotion and sponsorship. A match made in event heaven.